Immediately east of King City’s historic downtown lie 500 acres owned by Smith Monterey, a farming company that has owned the land since the early 1960s. In 2004 the City approached Smith Monterey to initiate a cooperative planning effort for the development of the property. 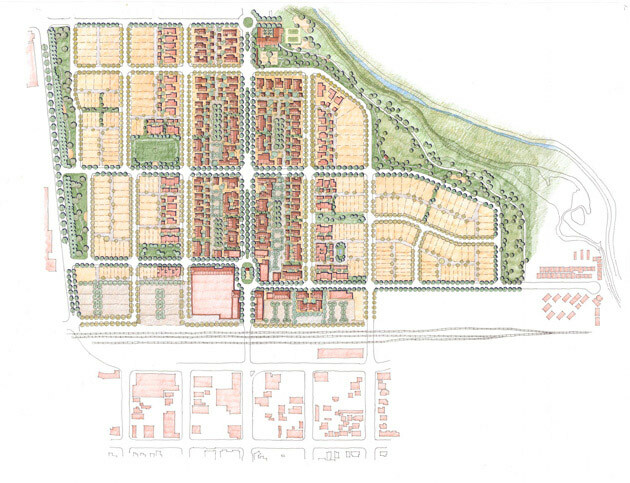 Smith Monterey retained David Sargent to lead a public design charrette to prepare master and specific plans for the entire 500 acres, plus a specific plan for the 100-acre Downtown Addition on City land that had been subdivided in 1908. The Downtown Addition includes a mixed-use neighborhood center that will extend the downtown’s fabric and economy to the east of a railroad that runs along the main town street. Farther east, the character changes to an urban residential neighborhood with a mix of live-work, row house, courtyard housing and quadplex buildings. Outside the neighborhood center, quiet residential streets, a wide range of house types and a number of neighborhood parks, greens, and rose walks define the neighborhood character. A creek runs along the south edge, with a large community park that provides both recreation and storm water management.